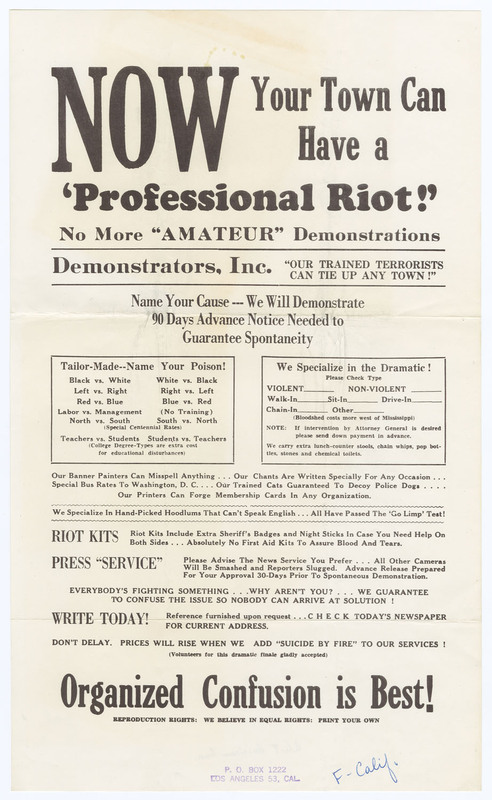 Hilarious flyer from California, 1965, held by Rare Books and Manuscripts, Columbia University. Click image for larger, readable version. Or click here for the Columbia webpage. 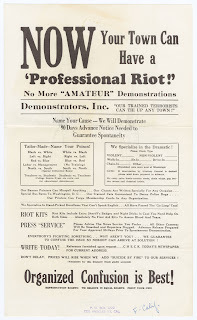 I particularly like the "90 days advance notice needed to insure spontaneity" and the "centennial discount" (this being 1965) for black v. white riots. Believe it or not, I just bought a box of city papers that had been stored in a safe in Santa Monica. They begin in 1880 and end in the 20s. But there were two pieces that were from the 60s. One is a rare newspaper of anarchic poetry and the other is this very leaflet! You lucky person! Sounds like quite a collection.